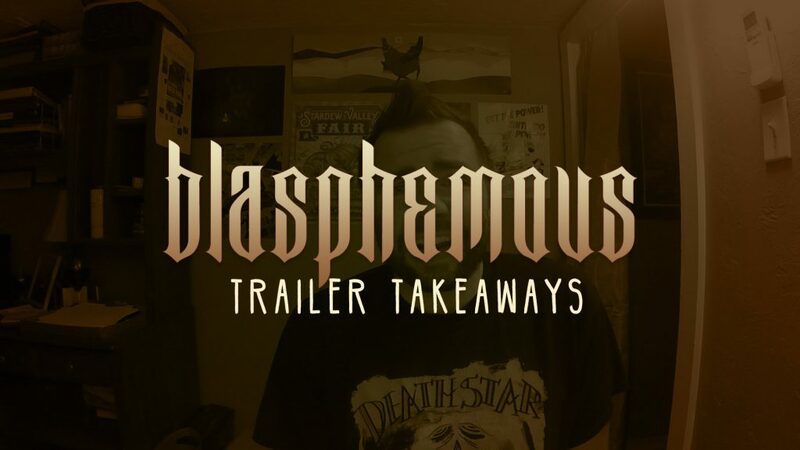 Blasphemous just launched [on Kickstarter] not even two weeks ago and it’s already tripled its goal. So it is definitely successful. And even though the trailer might be off-putting to some (okay actually, most) — I still think it’s damn-near perfect. Now, bear with me. You might not dig this trailer and that’s totally alright — there’s some absolutely key takeaways in here for game marketing. So, hang in there. Rally your tribe around what makes you you. Don’t be afraid if that puts anybody off. The action in your Kickstarter game is by-definition not complete. But when we see it in motion, we can have grace for it if the audio-visual feedback isn’t quite there yet. As long as it looks cool and there’s some solid tension in there, we’re with you. Sharp editing — where each player action is linked in separate scenes — that doesn’t hurt, either. We all know in this descending shot is that this is a weird-dark world with graveyards and bloodshed. And just like that, Blasphemous sets itself apart apart from the rest of herd. With kickstarter trailers, your world should draw us in more than anything else. Nobody knows anything about your game. Nobody knows anything about your world. Notice this song, how there’s this juxtaposition of two kinds of metal at once: the slow droning of Doom and the incessant Black Metal march. There’s even moments where this ultra-gloomy jam gets straight-up triumphant! Nobody else has this kind of music in their game. You can tell the composer created something new and unusual just to match the vibe. If you can afford an original composer? At the very least, people are going to buy your soundtrack! Whatever your game is really about? Be that twisted bloodshed, or rainbow-laden-peacemaking. Stick hard to that tension. And make it the most-important thing that we see the last thing. I’m M. Joshua. Find my trailer work at mjoshua.com [which has nothing to do with this trailer]. And? Feel free to subscribe — for the next time we look at a damn-near-perfect game trailer.